Founded in 1974, Solid Gold has been producing holistic, all-natural, and high-quality pet food products for more than four decades. This brand believes that because our pets give us so much love and affection, they deserve the best when it comes to their diet – that is why Solid Gold uses only the highest quality ingredients in each of their recipes. Solid Gold formulates all of their recipes around premium animal proteins like Alaskan pollock, farm-raised duck, and free-range venison with carbohydrate support from digestible carbohydrates like brown rice, tapioca, chickpeas, and more. This brand offers a wide variety of products for dogs in all life stages and of all breed sizes so you can choose the recipe that perfectly suits your dog and his individual dietary needs. Solid gold doesn’t use any artificial additives and their products are free from corn, wheat, soy, and other low-quality fillers. Although all of Solid Gold’s products are complete and balanced in addition to being subjected to rigorous standards for quality and safety, this brand still offers a 100% satisfaction guarantee. Your dog is sure to love this brand but, in case he doesn’t, you can always return the product for a full refund. The Solid Gold brand of dog food is a private label pet food company based in Chesterfield, Missouri. The Solid Gold company was founded in 1974 by Sissy Harrington McGill when she set out to create a nutritious and natural pet food product for her own dogs. Thus, the Hund-N-Flocken recipe was born. Over 40 years later, the brand is still going strong and has expanded their product line to include a wide variety of natural and holistic dry foods, canned foods, supplements, and treats. 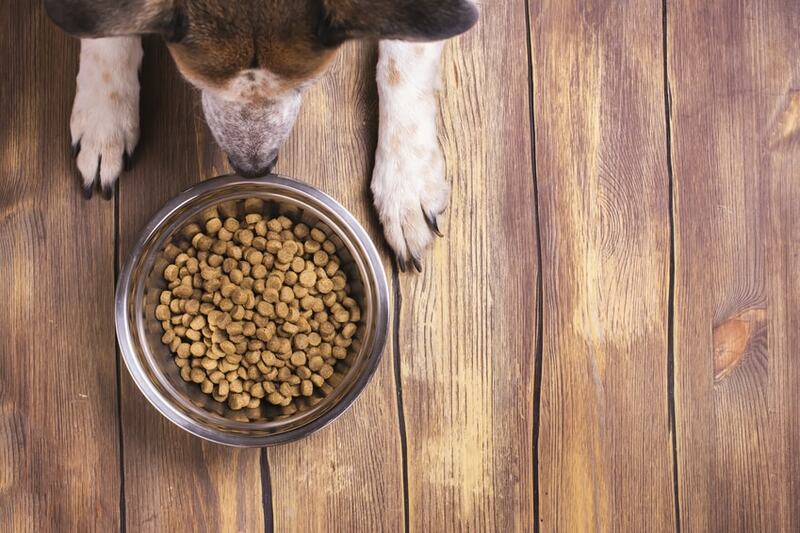 Is Solid Gold Dog Food Made in the United States? Solid Gold is a group of animal lovers and nutritionists who have the best interest of pets at heart. This group makes it their mission to give pets what they deserve in exchange for their undying loyalty and affection – a premium, holistic, and natural diet that enables them to live their lives to the fullest. According to the FAQ section of the Solid Gold website, all of Solid Gold’s dry pet food formulas as well as their canned dog food formulas are produced in the United States. The only Solid Gold products that are not made in the U.S. are their tuna-based canned cat food recipes. Solid Gold uses only the finest quality ingredients available, though they technically do not count as “human grade” because their products are manufactured in a pet food facility, not a human-grade facility. Where Does Solid Gold Get Their Ingredients? The Solid Gold brand specializes in holistic and all-natural pet food products for both dogs and cats. This company is headquartered in the United States which is also where all of their products are made, with the exception of their tuna-based canned cat foods which are made in Thailand. Though Solid Gold products are made in the U.S., some of their ingredients are sourced internationally, though never from China. Solid Gold states that they have “traveled extensively to deliver unique and beneficial ingredients”. For example, they use Alaskan pollock, Australian free-range venison, and farm-raised duck sourced from France. Regardless where their ingredients come from, Solid Gold is committed to high standards for safety and quality – every ingredient is thoroughly checked before being used in any of Solid Gold’s products. In May 2012, the FDA issued a recall for two Solid Gold dry dogs foods – WolfCub Large Breed Puppy Food and WolfKing Large Breed Adult Dog Food – due to potential salmonella contamination. Solid Gold dog food products can be found in some national pet store chains as well as local and specialty pet food stores – you can also purchase them from online pet food retailers. Solid Gold frequently offers coupons on the company website and you can sign up for the company newsletter using your email address to receive special offers. You may also be able to find Solid Gold dog food coupons from individual retailers. Are Solid Gold Products Expensive? The Solid Gold brand of dog food is a high-quality brand of dog food that is made with natural ingredients in holistic formulas – this means that you will pay more for this brand than you would for the average kibble. Prices may vary from one recipe to another, but you can expect a 24-pound bag of Solid Gold dry dog food to cost you between $55 and $75. High Protein recipes from Solid Gold come in 22-pound bags and sell for about $57 to $85. Solid Gold wet food comes in small 3.5-ounce cans as well as larger 13- and 13.2-ounce cans. For a 12-pack of 3.5-ounce cans you will pay between $16 and $25. For a 12-pack of 13-ounce cans you will pay $30 to $45. What Type of Recipes Does Solid Gold Offer? The Solid Gold brand offers a wide variety of product choices for both dogs and pets. This company specializes in holistic, all-natural dry pet food products made with premium proteins and highly digestible carbohydrates. You will find a wide variety of life stage and breed size-specific formulas for dogs in the Solid Gold dry food lineup. In addition to a large assortment of dry foods, Solid Gold also has a generous offering of wet food products. These recipes are also made with high-quality proteins, and many of them are naturally grain-free. You can find formulas for puppies as well as adult dogs, including breed size-specific recipes. Outside of their dry food and wet food offerings, Solid Gold also offers a selection of dog treats and nutritional supplements. When it comes to their pet food products, Solid Gold offers a wide variety of choices for dogs in all life stages and of all breed sizes. Both dry food and wet food recipes all start with a premium-quality protein and they are supplemented with highly digestible carbohydrates. Solid Gold does make use of many plant-based fats, though there are some recipes that rely primarily on animal fats. This brand doesn’t use any corn, wheat, or soy ingredients and their recipes are free from artificial additives. You will find, however, that some formulas contain a lot of supplementary plant fiber and some of the wet food recipes are thickened with carrageenan. This Solid Gold Sunday Sunrise Grain-Free Dry Food Recipe with Lamb features fresh lamb as well as sweet potatoes and peas. This formula is designed to support your dog’s healthy metabolism in a nutritionally balanced recipe that is both gluten-free and grain-free. In addition to being protein-rich and highly digestible, this formula also contains a unique blend of 20 nutritious superfoods and essential amino acids to support your dog’s total health and wellness – it also helps him to build and maintain strong muscles. This formula is free from corn, wheat, soy, and sugar as well as artificial preservatives, by-product meals, and added flavors. As promised, the main ingredient in this recipe is lamb – fresh lamb, to be exact. One thing you should know about fresh meats like this is that they contain up to 80% moisture by volume. All this means is that when the product is cooked to 10% moisture, a lot of that volume will be lost because the moisture cooks out. At the end of the day, the final volume of protein that fresh lamb provides could end up being much lower. That is why it is good to see lamb meal as the second ingredient. Meat meals have already been cooked to remove moisture which makes them a highly-concentrated source of protein and an excellent addition to this recipe. There are also a few supplemental sources of protein listed including dried egg and pollock meal. After the lamb and lamb meal come the main sources of carbohydrate in this Solid Gold Sunday Sunrise Grain-Free Dry Food Recipe with Lamb – sweet potatoes, chickpeas, and peas. All of these are highly digestible carbohydrates and grain-free carbohydrates at that. That makes this recipe a good choice for dogs that suffer from food allergies or sensitivities, particularly to grains. There are also several supplementary carbohydrates including potatoes and tapioca, plus several fresh fruits and vegetables. In addition to these carbohydrates you will also find several sources of supplementary fiber including pea flour, pea fiber, and dried chicory root. The total crude fiber content of this recipe is 4% which is well within the recommended maximum for dogs of 5%. The main source of fat in this recipe is canola oil. This is not a bad ingredient, but it is important to note that plant-based fats are less biologically valuable than animal fats for dogs. Fortunately, salmon oil is listed as a supplementary fat and your dog will also get some fat from the fresh meats and meat meals. The remaining ingredients in this Solid Gold Sunday Sunrise Grain-Free Dry Food Recipe with Lamb consist primarily of fresh fruits and vegetables, synthetic supplements, and dried fermentation products. The fresh fruits and veggies provide supplementary fiber, but they are more valuable as natural sources for key nutrients. Among the synthetic supplements are several chelated minerals which offer excellent absorption for dogs. The dried fermentation products are included for probiotic support. This Solid Gold Sunday Sunrise Grain-Free Dry Food Recipe with Lamb is formulated to meet the nutritional levels established by the AAFCO Dog Food Nutrient Profiles for maintenance. Overall, this Solid Gold Sunday Sunrise Grain-Free Dry Food Recipe with Lamb is an excellent source of quality nutrition for adult dogs of all breeds and sizes. This recipe starts off strong with both fresh lamb and lamb meal at the top of the list, followed by several highly digestible grain-free carbohydrates. This recipe could stand to be a little higher in crude protein and fat, but all of the protein sources are of high-quality and there are no plant protein concentrates to worry about. This formula may be a little high in fiber, but it is still below the recommended maximum, and much of that fiber comes from fresh fruits and vegetables, not just supplementary fibers. This recipe could be improved with the use of an animal-based fat as the main source and it could do without some of the supplementary fibers like pea flour and pea fiber. All in all, however, this formula is an excellent choice for an adult dog of any size or breed. This Solid Gold Star Chaser with Chicken Canned Food Recipe is a holistic recipe for dogs in all life stages. It features protein-rich chicken as the primary ingredient, supplemented with both brown rice and barley as digestible carbohydrates for energy and healthy digestion. This recipe will help your dog to build and maintain lean muscle mass and a healthy digestive system. It also contains plenty of healthy fats to support his skin and coat. This formula is packed with nutritious and wholesome ingredients and it is free from corn, wheat, soy, and artificial additives. As promised, the first ingredient in this recipe is fresh chicken. While fresh meats may lose some of their volume during cooking for dry foods, that is generally not the case with wet foods. This formula has a 78% moisture content which is supported by the inclusion of chicken broth as the second ingredient. The fresh chicken is supported by supplemental proteins as well, like chicken liver and ocean whitefish – there are also some supplementary plant proteins like alfalfa meal and flaxseed meal. The chicken liver also provides some healthy fats as well as plenty of natural flavor. The main carbohydrates in this Solid Gold Star Chaser with Chicken Canned Food Recipe consist of ground brown rice and barley with supplementary sources like carrots, oatmeal, and flaxseed meal. Guar gum is included as a thickener and a supplementary source of fiber, as is the cassia gum. You will also notice that carrageenan is listed – this is also a thickener but it has been linked to negative health effects in some dogs, so it is not a quality ingredient. You will also note that the primary source of fat in this recipe is plant-based. This is not necessarily a problem, but it will be less biologically valuable for your dog than an animal fat. The remaining ingredients consist primarily of synthetic supplements, some of which are chelated minerals which is always a good thing. This Solid Gold Star Chaser with Chicken Canned Food Recipe is formulated to meet the nutritional levels established by the AAFCO Dog Food Nutrient Profiles for growth and maintenance, except for growth of large size puppies (70 lbs. or more as an adult). Overall, this Solid Gold Star Chaser with Chicken Canned Food Recipe is a good source of nutrition for your dog and it contains a number of high-quality ingredients. This recipe starts off strong with chicken and chicken broth as the top two ingredients with two additional proteins and two digestible carbohydrates up next. It is worth noting that the main carbohydrates are both grains, and the barley contains gluten – that could cause a problem for some dogs who suffer from food allergies or sensitivities. It is also important to note that the main source of fat in this recipe is plant-based and that carrageenan (a red flag ingredient) is also used. All in all, this recipe has a little bit of room for improvement but it is definitely much better than many dog food recipes on the market.